Now, if you will excuse me, I must return, as I wish to speak to Mr Shang on the subject of a noticeboard for residents. 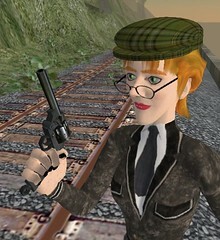 One thing that always amazes me that anyone has ever heard of me in Second Life at all. I fear that I shall never get over the idea that anyone might remember my name or, for that matter, know it without me having met them or annoyed them in some way. I am most gratified whenever anyone does, believe me, but each time I am quite astounded by it. The above came to mind when I was asked by the very talented Tateru Nino to pose for the illustration on the Tower on a Tarot deck. Of course, I was immensely flattered to be asked, and I think that it ended up rather well - you can see the full set on Dwell On It. 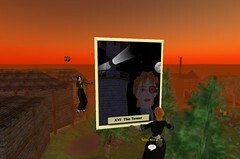 I think it's a fascinating thing to interpret the Tarot in the medium of Second Life avatars; an activity that I am proud to be connected to. Torley as the Fool is particularly good. * To some, It symbolises failure, ruin and catastrophe. * To others, the Tower represents the Paradigms constructed by the Ego, the sum total of all Schema which the mind constructs to understand the universe. The Tower is struck by lighting when Reality does not conform to expectation. * Epiphanies, transcendental states of consciousness, and Kundalini experiences may result. Hm. Well. This is not intended to be a conventional interpretation and thus I will not take the "ruin" elements to heart. My Lighthouse has yet to be struck by lightning, though Reality has commonly failed to conform to expectations, mostly on the matter of physics and sim boundaries. Recently I have been doing many things, as always, but today I decided to take a break from speculative technology and concentrate on something that I find strangely relaxing - the replication of antiquities in Second Life. It is a good test of one's skills to attempt to create a functional duplicate of an object that exists in the "Real World", and it is ideal for those moments when one is not feeling desperately inspired and full of ideas for novelties, as all of the details are already there. In fact, quite often during the process one comes up with an idea for something entirely different. Just as the way around Writer's Block is to write, so the way around Creator's Block is to create. This Sunday I decided to build a replica of Dr Watson's service revolver, something which would be of interest to a few people, I judged. There are different opinions as to precisely which model this would have been, but I settled on the .455 Webley as my choice. In actual fact I based my model around the Mark 6 version, which was only created in 1915, but don't tell anyone that. They all look rather similar in any case. 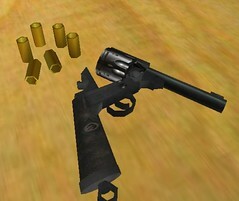 * breaks open when one has fired all six rounds, ejects the empty cartridges (which fall to the floor) and animates one's avatar to engage in reloading. You know, if one is going to spend hours scouring the Inter Net for textures and images, one should at least also spend some time scripting suitable behaviour for the device. A couple of antiquarian friends of mine with a particular interest in antique firearms have indicated their approval of the final product, and thus I think I shall put it out for sale forthwith. To return to my original theme, that is the other thing that continually surprises me about Second Life, the idea that people will actually pay good Lindens for things that I create. I should hope that they would as I have already spent several hundred on textures, animations and sounds for this one item. It is not just a question of one payment for each component, either - it is impossible to tell whether an animation appears just right, or whether a sound seems quite appropriate, before one has uploaded it and paid to do so. Incidentally, I am selling my land in Theretra. If anyone wishes to buy a continuous plot of land there with amenable neighbours, please do contact me. 3. email said string to a particular address once it has reached a certain size, or when a new day has been reached. for instance, allowing one to monitor how many people are interested in that object, whether it might be in an inconvenient place, and so on. Even more information can be gathered by the use of volume detect objects. For the uninitiated, the use of llVolumeDetect turns an object phantom, and triggers collision events as appropriate whenever anyone walks through it. Such a thing is perfect for monitoring who is going where in one's property. On that basis I have also placed a doorway monitor object in the free vendors, the script being fully commented, which will tell a main event monitor whenever someone enters or leaves a building. The result of all of this is a deeply seductive voyeuristic experience. I look forward to the reports each day, telling me who has gone where and touched what while I have been asleep. I am not entirely sure that this is healthy. I would just like to say that I cannot believe that anyone took the time to score 770 on my Steel Pigeon Projector. I re-engineered it to record the highest score so far, and clear the scoreboard every day, but really. 770? Even if all of those were double-scoring red pigeons, that's 335 of them to be shot down. Still. I certainly mean no criticism. If it is seen as entertaining enough, then by all means shoot as many as you desire... they feel nothing, it is not cruel. * Pistols for retail, as standard, can be reloaded from any ammunition box, or their damage changed using any damage selection device. 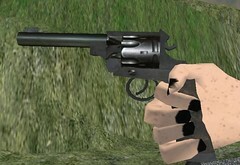 If anyone wishes to have pistols that will only respond to objects owned by a particular person (as is the case on my Duelling Ground - one can only load the free pistols from my cartridges) they need only make the request and I will be happy to create pistols modified to their specifications. The Duelling Pistols crate comes with all of the devices required for a duel, as well as two pistols, one copiable (for the owner) and one transferrable (to be passed to his or her opponent). Additional transferrable pistols are a mere L$25 apiece. Commercial announcement completed: I can now speak on other matters. I was pondering possibilities regarding the Following Camera in Second Life, and found it odd that it was always the movement of the camera that was determined by the direction of the vehicle or person moved, which would tend to ignore the camera angle. Why not the other way around? Or near to it in any case. With this in mind I built a Giant Glass Pinball. Englobing oneself allows one to move around by changing flux density in response to the Grid's magnetic field; so nothing unusual there, then. 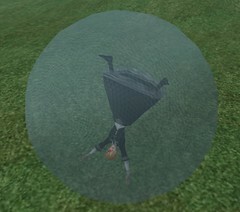 And there is some fun to be had just from bouncing around the landscape and watching oneself spin dizzyingly. However, one will notice when using one's forward, backward, left and right controls that they move in relation to the current camera position. Forward will move you away from the camera, backward towards it and left and right perpendicular to its direction. (The pinball has been modified so that it will not launch into the air or attempt to drive itself into the ground, though by bouncing off solid objects one can achieve some amusing heights and tumbles.) Thus if one holds down the backwards key, one will repeatedly travel towards a certain point, pass through it and then go backwards. The suggested process to see this properly would be to rez the Pinball, move the camera to a suitable position - I would suggest a high-up one - then Englobe oneself, locking the camera there. It can be released for repositioning or locked again by simply touching the Pinball. It should be noted that this is not technically a vehicle at all, merely a physical object propelled by llApplyImpulse, and as such its facing is entirely irrelevant, as can be seen by the peculiar angles that one englobed within it finds themselves at. The Pinball may be found in the Gadgets dispenser at either the Laboratories or Ordinal Enterprises, along with whatever other ridiculous things I've made since the last time I wrote here - I think there was a drunkenness attachment as well, for instance. I am sure that regular readers know the sort of nonsense that I tend to create. 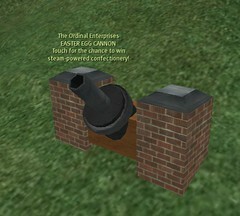 Ordinal Enterprises is proud to announce an Easter event of sorts: the Easter Egg Cannon. Merely find and touch the above device (which should not be a matter of great difficulty) and... well, what to do should become clear. I am not planning to make a huge amount of steam-powered confectionery in the future, and know of no-one else in the business of doing so, thus this will likely be your Only Opportunity to acquire such a thing - and for No Charge! How can this be resisted by a rational lady, gentleman or other? Product not for internal use. Ordinal Enterprises is not responsible for diabetic comas or coal poisoning. Edit: Well, if you, the reader, did not pick one up, I fear that you will never obtain the item. My apologies, but I did say that it would only be available for a limited period. (c) creating a Duelling Field. Once paralysed by peculiarities of the physics Engine, I decided to concentrate on something a little more conventional, the creation of an area specifically for duelling - the settling of scores by the skill of arms. I have created an area specifically for this purpose, just across from my rapidly-expanding home in Theretra, at Theretra 177, 168, 98. What concerned me (apart from a simple "ring out" system) was that weapons should be balanced for this purpose, and so I have provided duelling pistols for general use. These pistols are designed in a manner such that their activities are easily documented. One can only load them with bullets by touching a specific ammunition box, and every bullet loaded causes the pistol to say on a public channel that it has been loaded, and with however many bullets. Thus, one can always be sure that one's opponent is keeping to the correct rules. The matter of shield devices has been concerning me. Most shields are gaudy things that are quite noticeable, but it would certainly be possible to have one that merely nudged an approaching bullet out of the way, and this would be difficult to detect. I am working on this particular issue. I also have a rapier that is usable for less clumsy, random duels, and I will be putting this out for general use in the near future. Edit: The duelling system is now for sale. I would like to mention before closing that Roger Wake has used the windmill code to build his own wind turbine, of a more modern nature, which you can see at Arah 76,147. I am extremely flattered that my scripting has been of interest to others and would encourage anyone to visit this particular creation.